Greetings, Moda Bake Shop readers. My name is Karen Miller, and I’m a new Chef here at the Bake Shop! I live in the beautiful Finger Lakes Region of Upstate New York, USA, and I blog about all things Quilty at Karen’s Quilts, Crows and Cardinals. Stop by and check out my projects, tutorials, and other happenings. 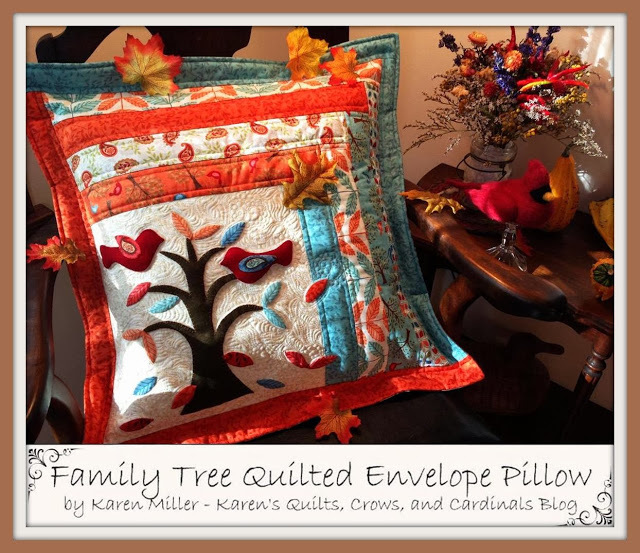 Today I’m excited to share a Quilted Envelope Pillow recipe using Deb Strain’s “Family Tree” fabric. With its beautiful colorways, “Family Tree” is perfect for fall – AND – spring projects! 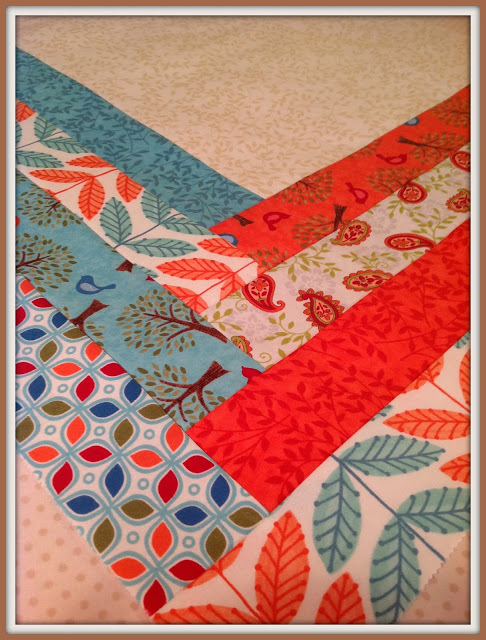 As you can see from my Blog, I’m addicted to birds – so the Family Tree birds and paisley along with some awesome dimensional cuts have me sold on this line… I’m sure you will LOVE IT too! 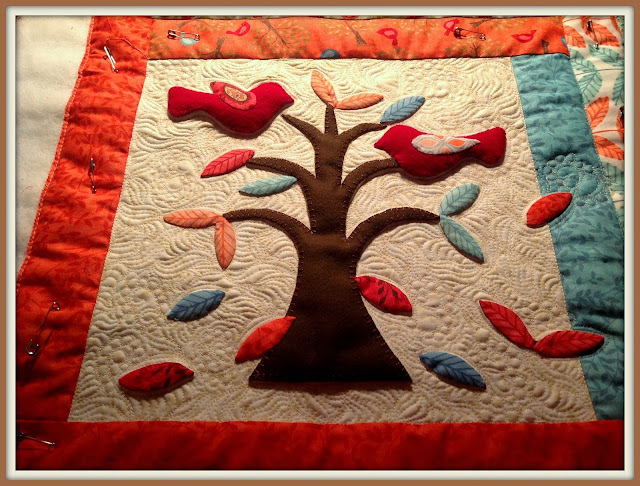 Several techniques were used to complete the quilted pillow including machine piecing, applique, fussy cutting, and free motion quilting. 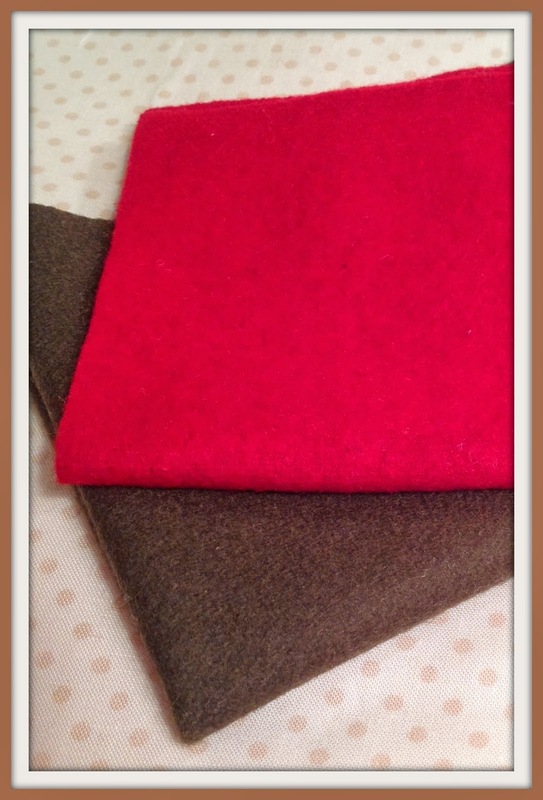 Both cotton and wool fabric were used in this sample — I hope you enjoy the variety. 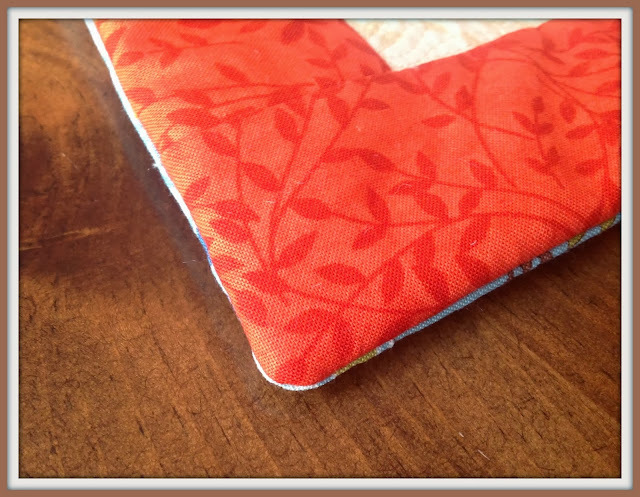 The finished pillow fits a 20″ x 20″ pillow insert and has a cute little 2″ flange around the outside! Please review all instructions before getting started. 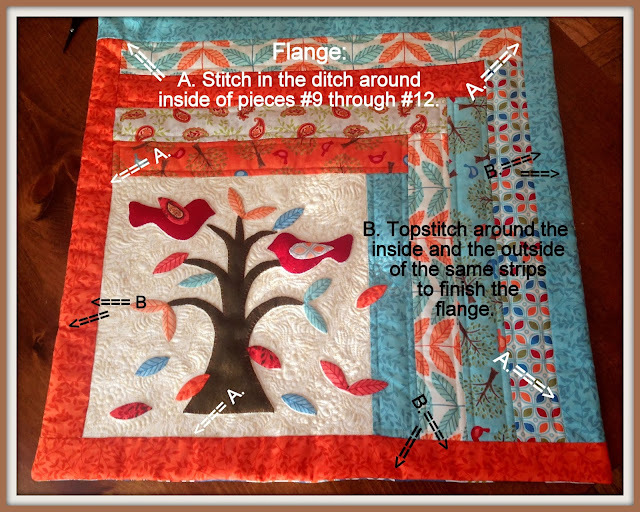 Unless otherwise indicated, all piecing was completed using a scant 1/4 inch seam allowance. 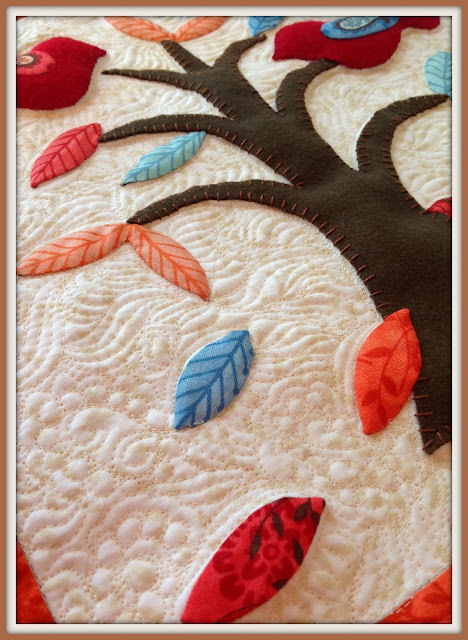 Applique Background: Cut one 13″ x 13″ square using Family Tree Cream or any other neutral Moda fabric. 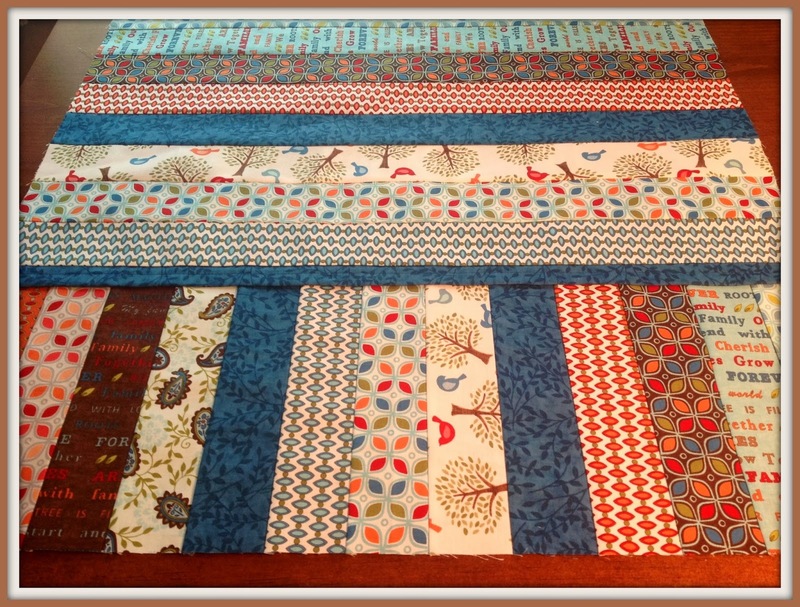 Pieced Pillow Top : From your Jelly Roll choose 5 to 10 different strips for the pillow top – The sample was completed using 7 different fabric strips and alternating lighter/darker fabrics in the block. 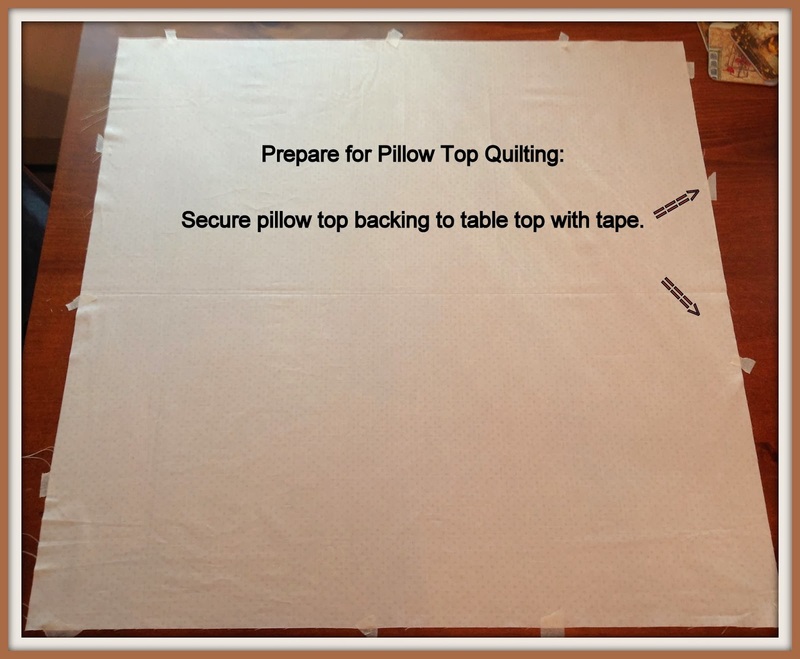 Cutting and Piecing Pillow Top: Using the “Piecing and Cutting” diagram below, cut strip sizes and sew to the cream applique background. Note: The diagram indicates the order in which you piece AND the size of the cut piece. 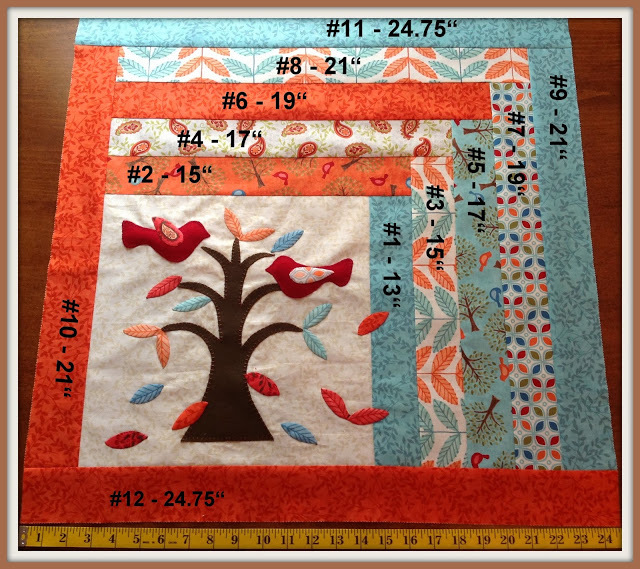 Example: #1 – 13″ represents the first piece you sew to the background and it is cut 13 inches long. 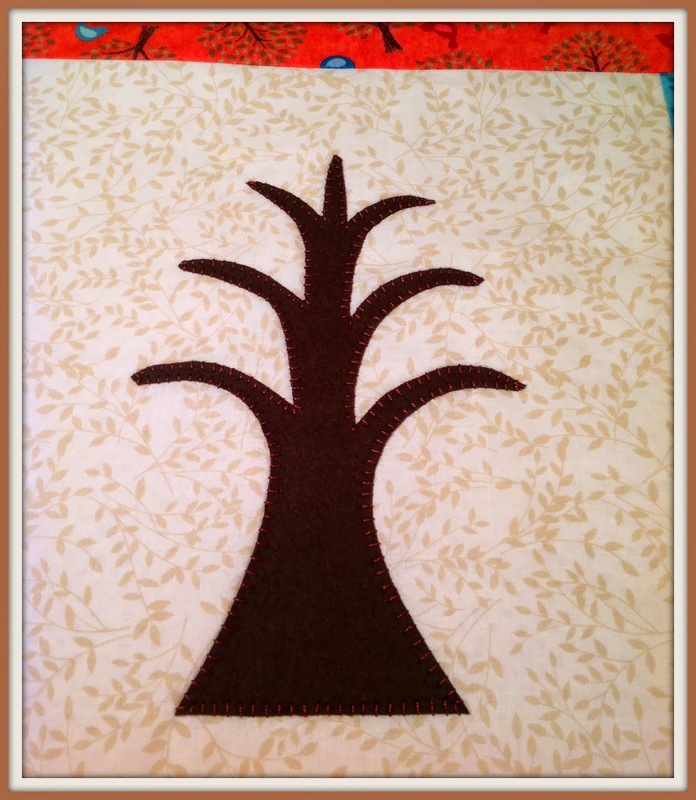 Note: Above pieces #9, #10, #11 and #12 were sewn to the pillow top after I completed the applique. You can sew them on at any time. Take 1/2 of the desired size as your target, fold your fabric to the target size plus a bit of overlap. 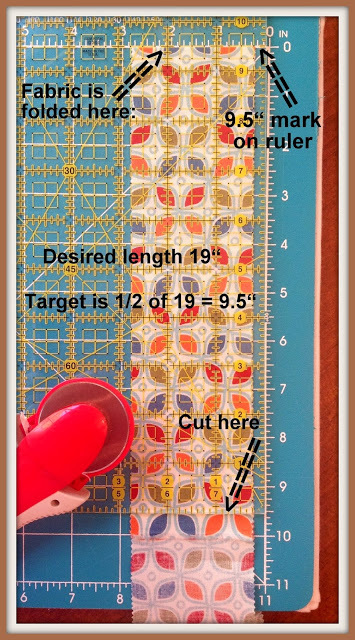 Find the target size mark on your ruler and place it on the fabric fold. Trim the opposite end. This method allows you to remove the selvage while cutting the desired strip size and helps avoid LONG strip and ruler alignment. 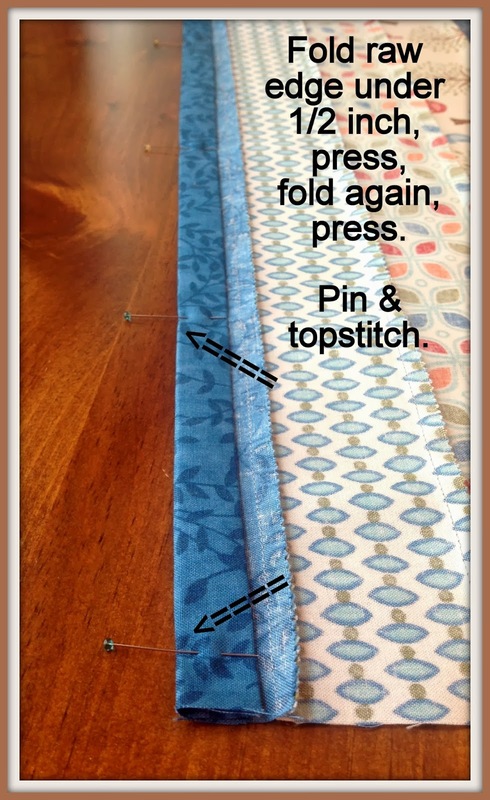 Now, back to the pillow top — be sure to press your seams toward the outside of the pillow after each strip is sewn. 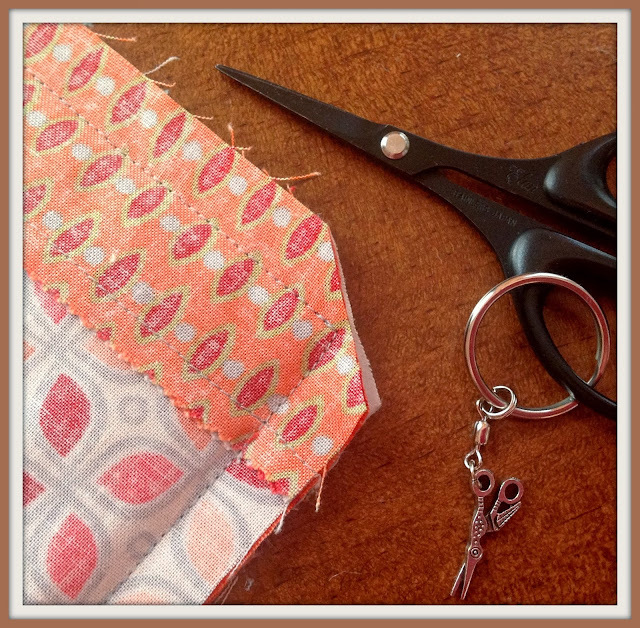 I was taught to first press the seam flat before pressing it in the desired direction. The seams come out beautifully using this method. 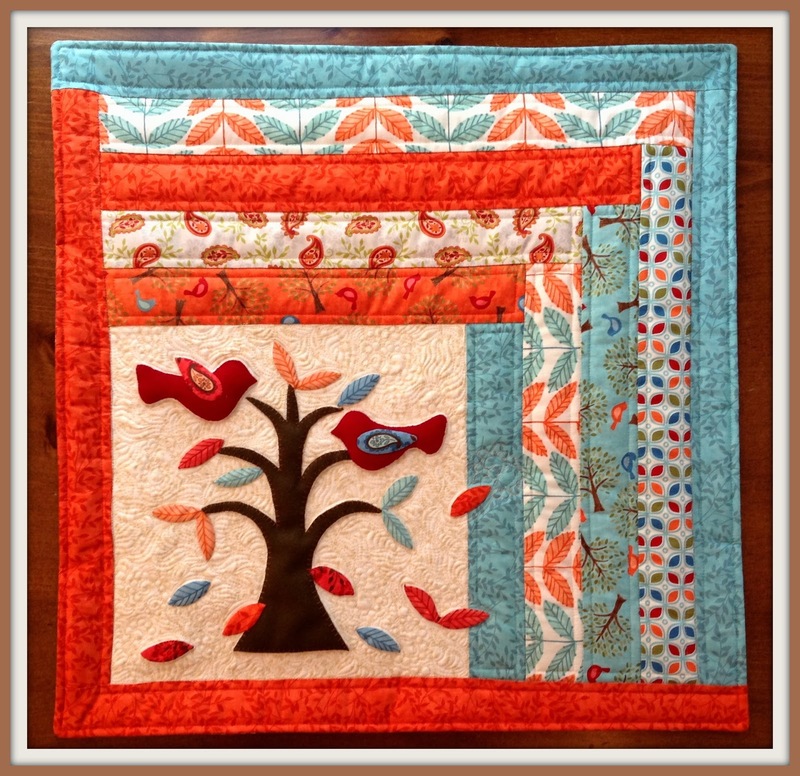 Now that you’ve completed most or all of the piecing on the pillow top it’s time to applique! 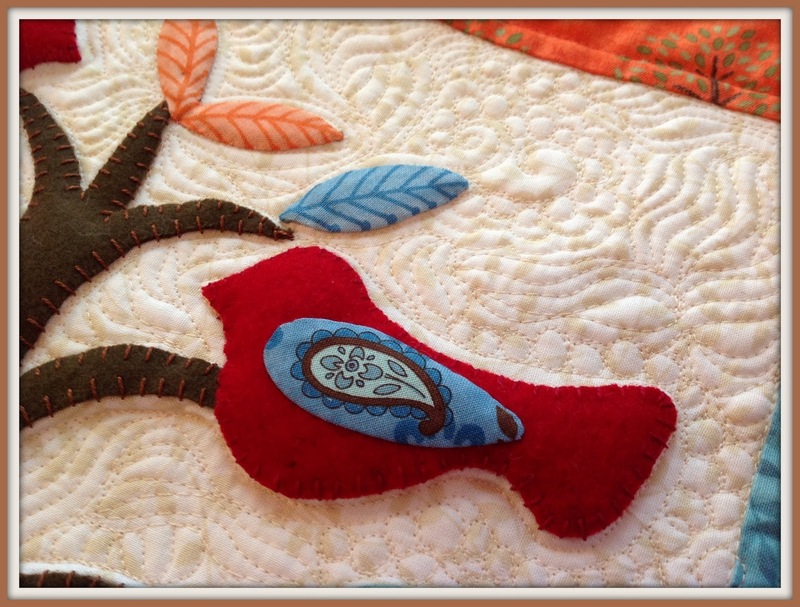 The applique portion of the pillow allows for great flexibility! 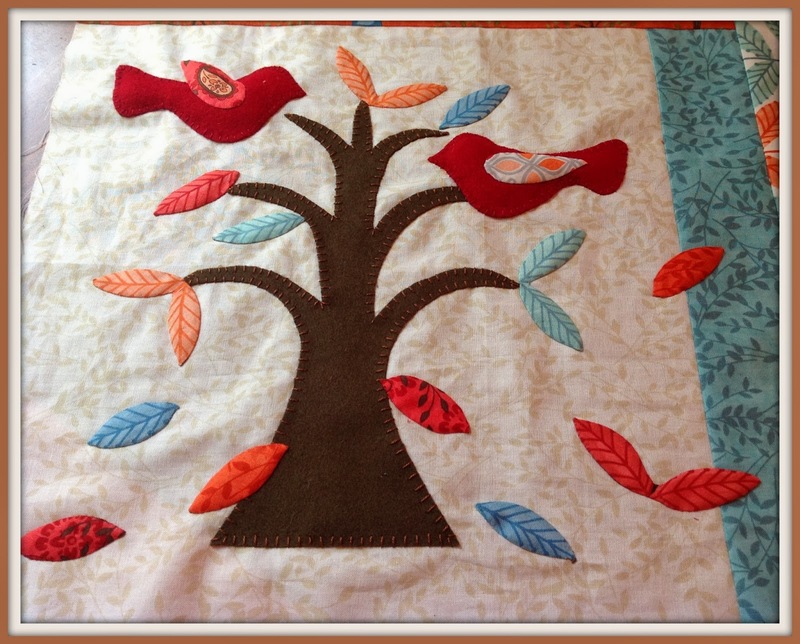 In the completed sample I used Moda Wool for the tree and birds and attached them to the background with a whipstitch (sometimes referred to as an overhand stitch). 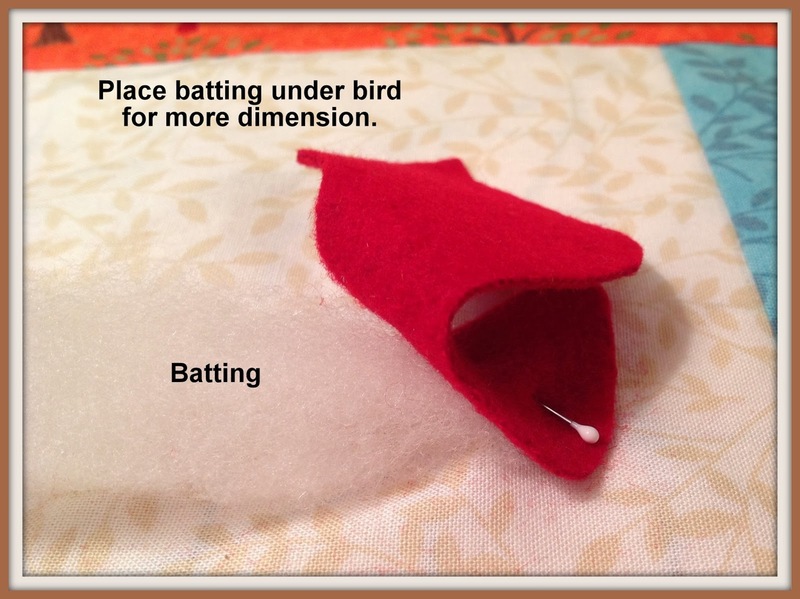 The birds were stuffed to give them dimension. 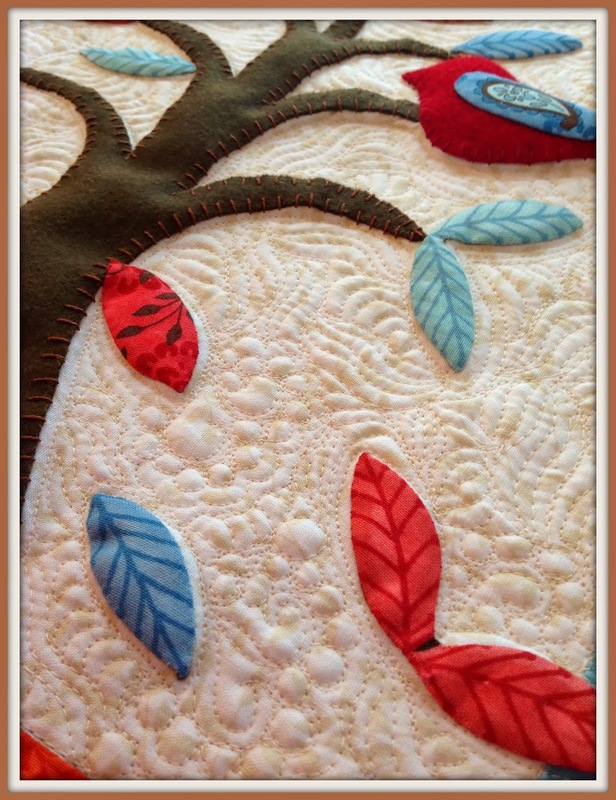 Needle turn applique method was used for the tree leaves. 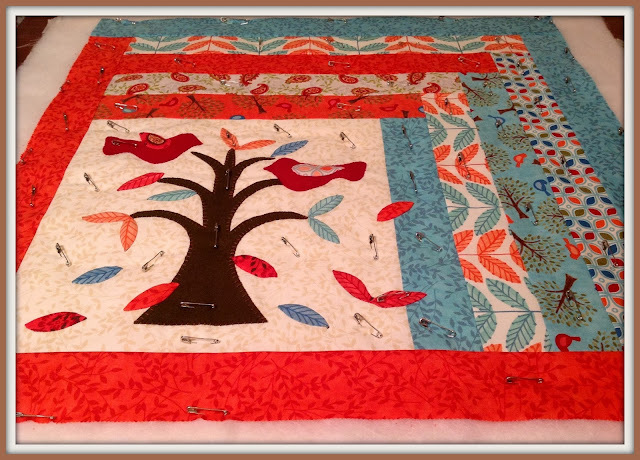 In all cases, basting was done with applique pins. If you would rather not use the sample methods, there are many applique options available including raw or turned edge applique, fused or glued, with hand or machine stitching. If you have any questions on any particular method, leave a comment here or on my blog, and I would be happy to give you feedback. 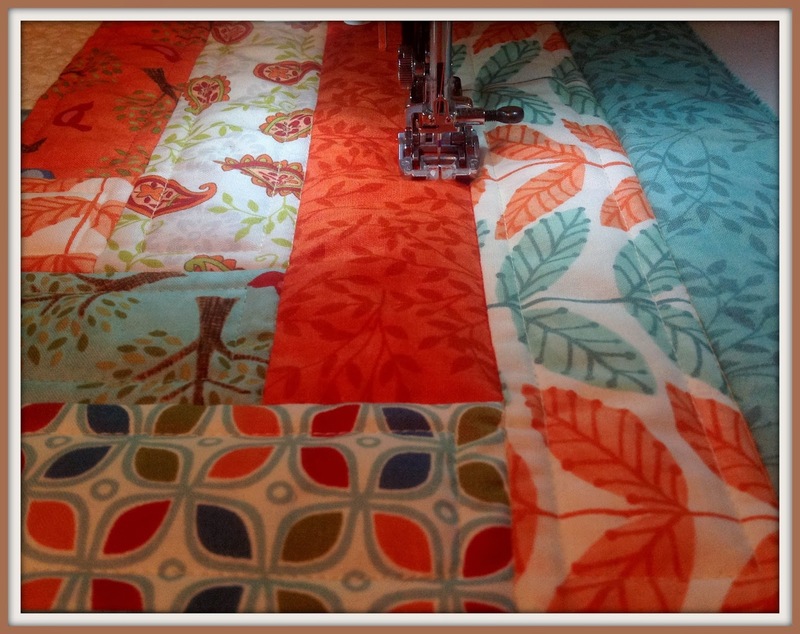 Also, check out the great Moda Bake Shop Basics tutorials on Machine Applique and Turned Edge Machine Applique. Tree above in Moda Marble — Yummy ! 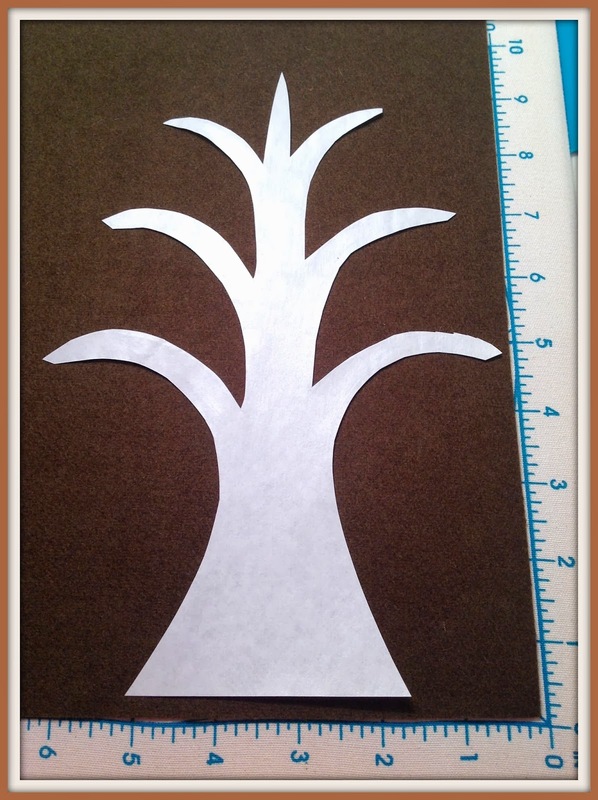 Using the tree template below, trace the tree design to the dull or paper side of the freezer paper. 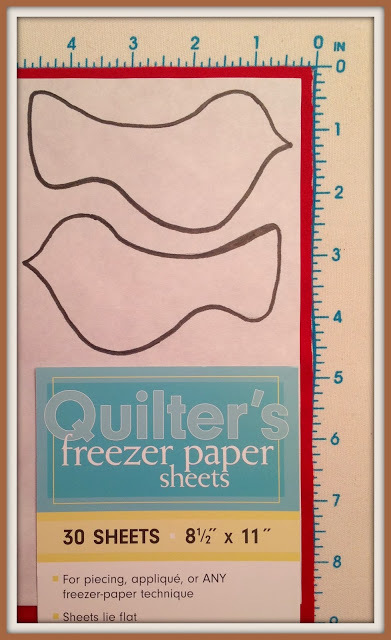 With a dry iron set on **medium heat, press your freezer paper to the right side of the wool. **Use care not to burn and/or discolor your wool. Cut along the drawn line. 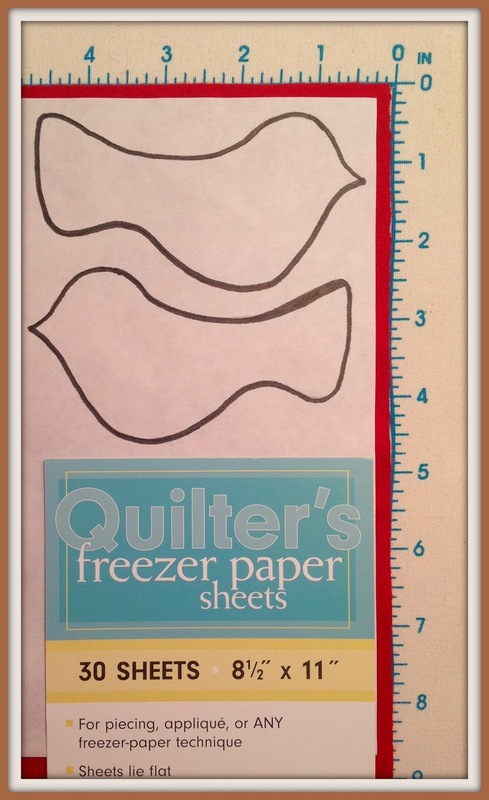 Remove the freezer paper. Use applique pins to secure the tree to the background fabric, then use Pearl Cotton thread to stitch using a Whipstitch. 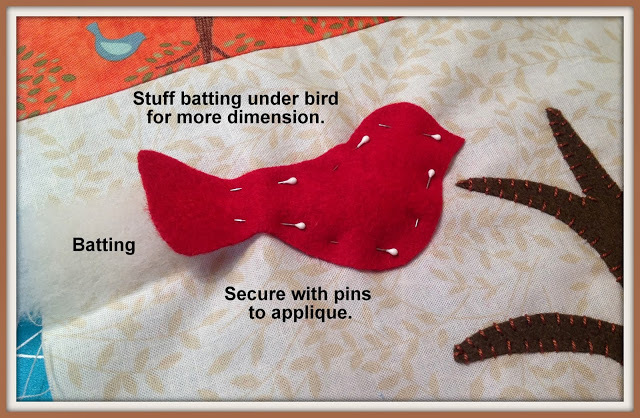 Once your tree is stitched down, use the same techniques to cut and stitch your birds. Before stitching the birds to the background you can (optionally) add some dimension by stuffing them with batting. 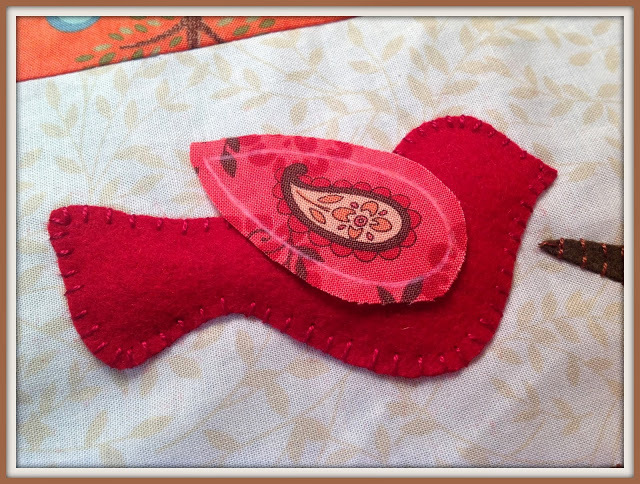 Once the birds are stitched to the background, give them each a wing. 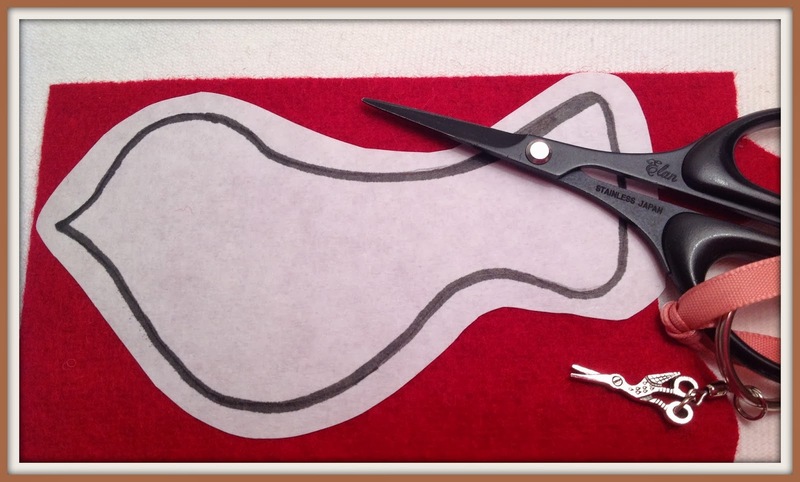 I fussy cut paisley wings using clear template plastic to help find the perfect fussy cut. You’ll notice that I auditioned several different fabrics for wings — there are many great choices. 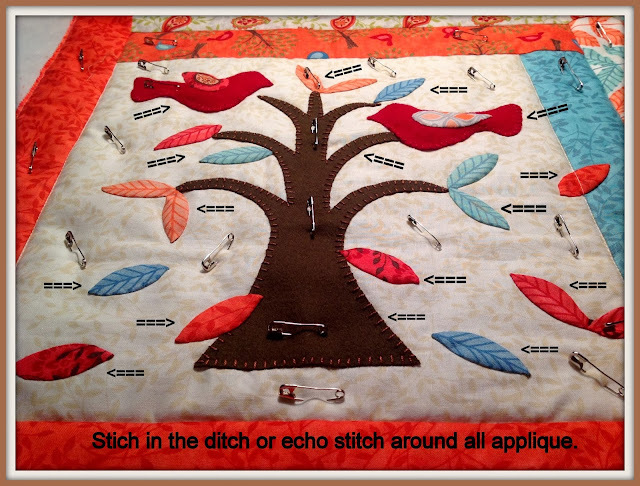 Choose what looks good to your eye and attach using your favorite applique method. 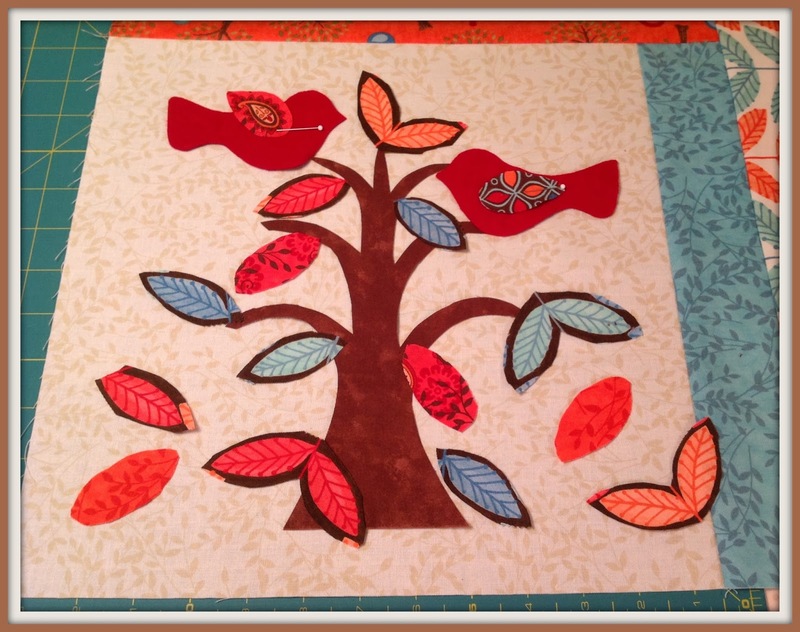 After stitching the tree, birds, and bird wings to the background, choose several strips from the jelly roll and fussy cut leaves to complete the tree. 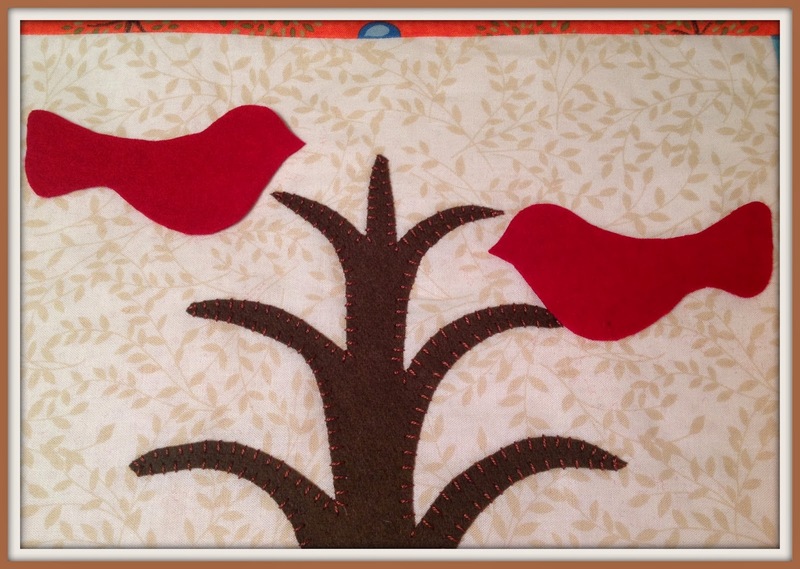 The sample leaves were completed using needle turn applique, but use your favorite applique method. For a fast and easy solution consider raw edge applique using fusible web to secure and machine top stitch for added interest. Once the applique is completed, add the 4 outside border pieces (pieces #9 through #12 from the Piecing and Cutting Diagram above). Your unquilted pillow top should measure appx 24 3/4 inches square. In the sample, only the pillow top was quilted. Prepare the quilt sandwich on a table top — the pillow size is perfect because nothing drapes over the edges of the table! 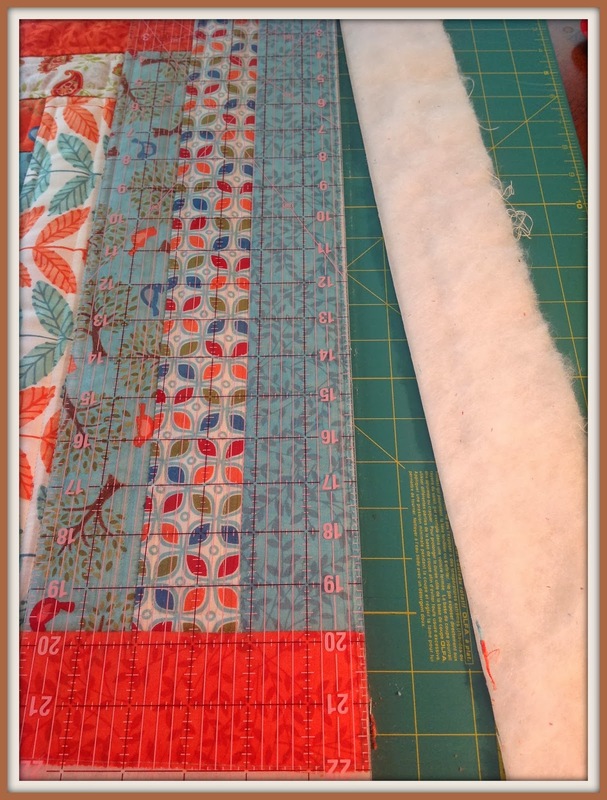 First, lay out your backing fabric — remember this fabric will not show once your envelope pillow is completed, so use a less expensive muslin or a light colored cotton fabric. Now secure the backing fabric to the table with tape, pulling it taut, but using care not to stretch your fibers – you don’t want it to spring back when the tape is removed. Next, position and smooth batting over the backing, secure it with tape, remembering not to pull too tight. Lastly, position and smooth the pillow top right side up on the batting, always smoothing from the center out and securing as you smooth. I use quilting safety pins to baste my quilt tops, but there are other methods including spray basting and basting with straight pins and soft tips. 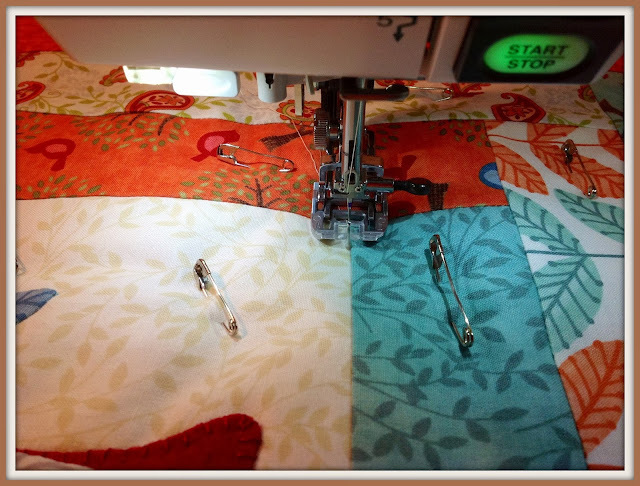 Using matching thread and a walking foot, stitch in the ditches along the strip pieces to stabilize the pillow top before Free Motion Quilting the applique area. 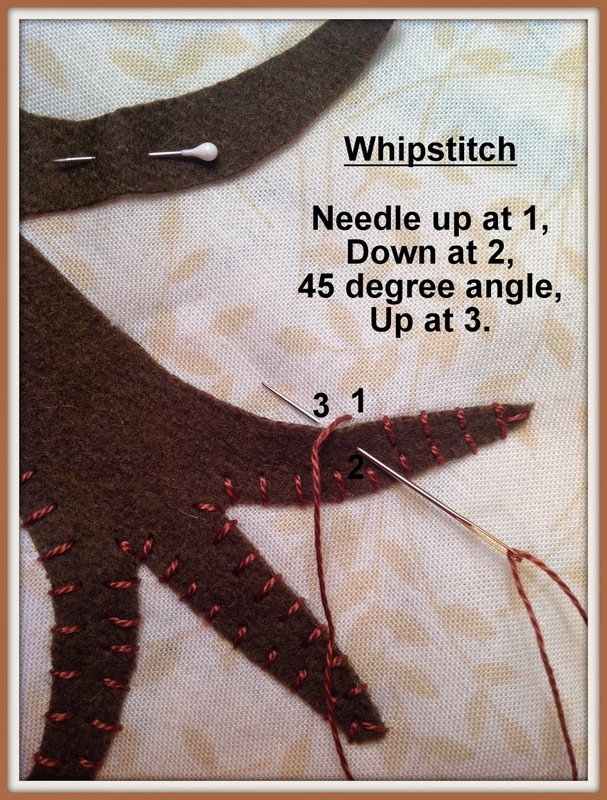 Start at the edge of the applique background and work your way outward – stitching in the ditch. 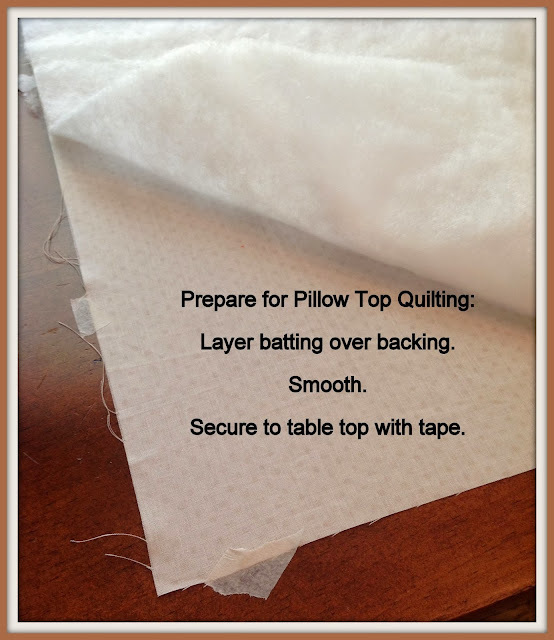 Also, baste stitch around the outside perimeter of the pillow top. 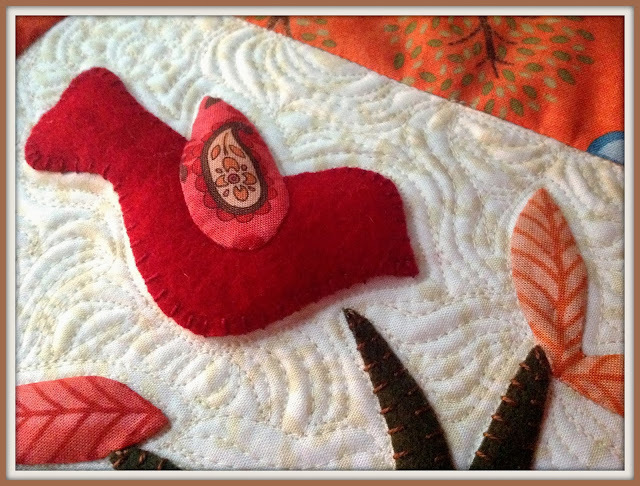 Use a top and bobbin thread that match the applique background, put your darning foot on, and drop the feed dogs on your machine. For ease of movement, use a Supreme Slider on your machine bed. 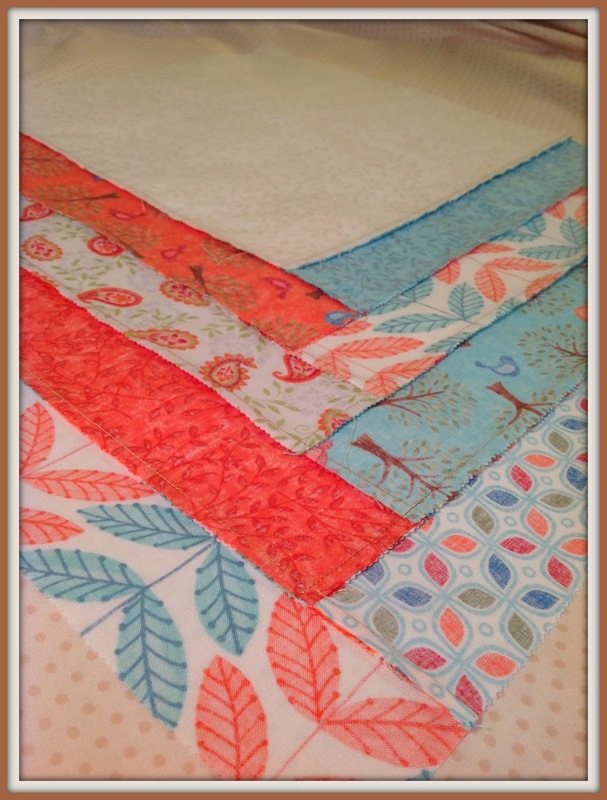 Check out my blog in the next few weeks for more “Free Motion Quilting Basics”. 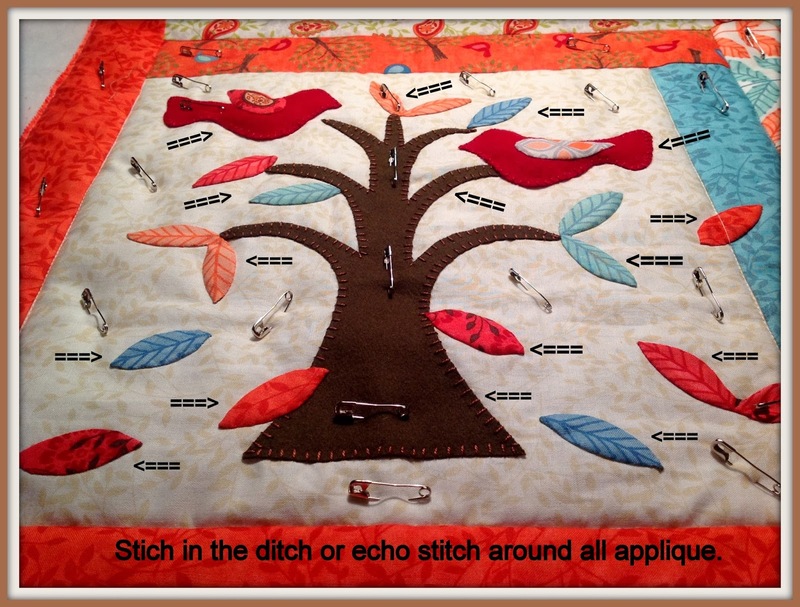 Start by echo stitching around each applique piece. 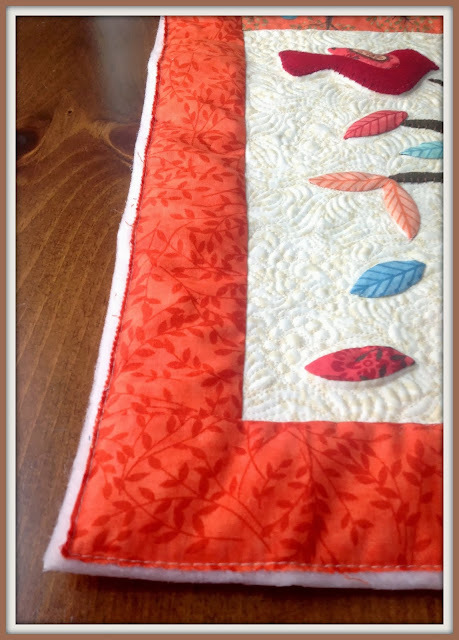 I used Aurifil Mako 50/2 in Color #2000 thread to quilt the applique area – the color matched perfectly! After you’ve echo stitched the applique, quilt any design you like to fill in the background. 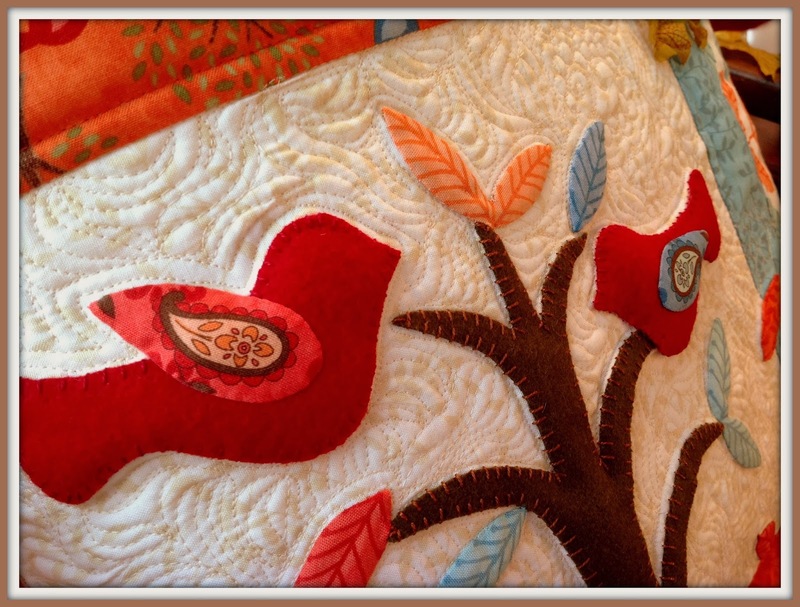 The more densely you quilt, the more your applique pieces will POP! The sample was quilted using a combination of “McTavishing”, circles, and swirls, which all added movement to the piece. Once you have finished quilting the applique area, quilt the pieced strips with a top stitch. I used a 2.70 stitch length on my machine. Use a thread color that complements the fabric. 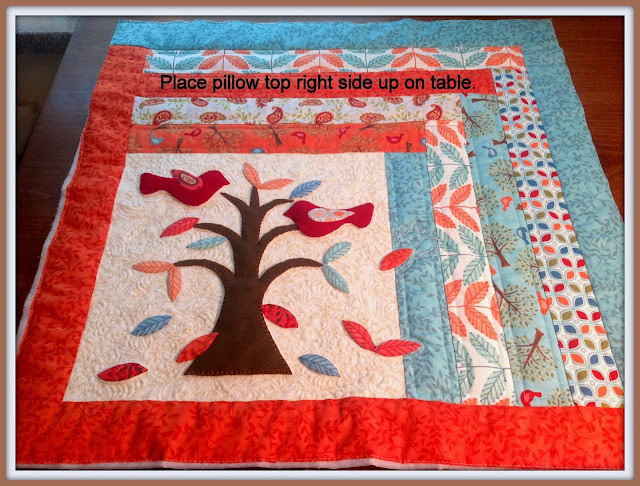 Depending on the density of your quilting you may have to make some fine adjustments to square up the pillow top. On the sample piece the right side was simple and squared up nicely. 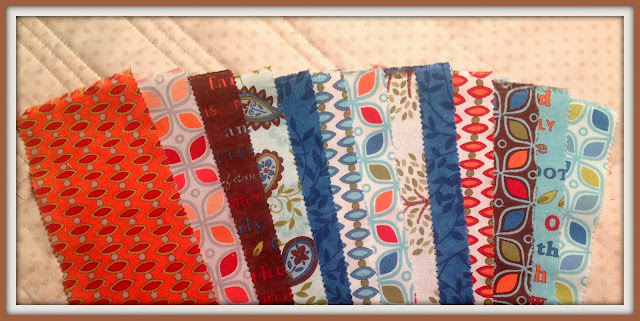 However, because of the dense quilting in the lower left corner of the sample, some “fine adjustments” aka “fudging it” were made on the left and bottom edges. You can see from the diagram below that the “fine adjustment” included trimming outside of the top fabric, resulting in only the batting and backing being square. 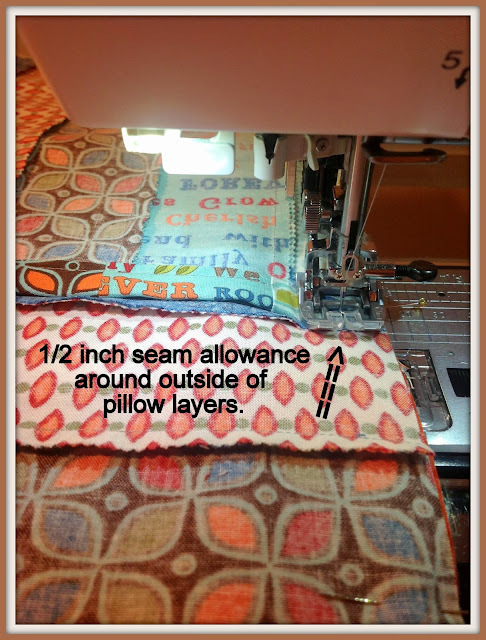 “Squaring up” which does not cut into the top fabric is not a problem; however, it may require you to increase the seam allowance when the pillow layers are stitched together. This was the case with the sample pillow. 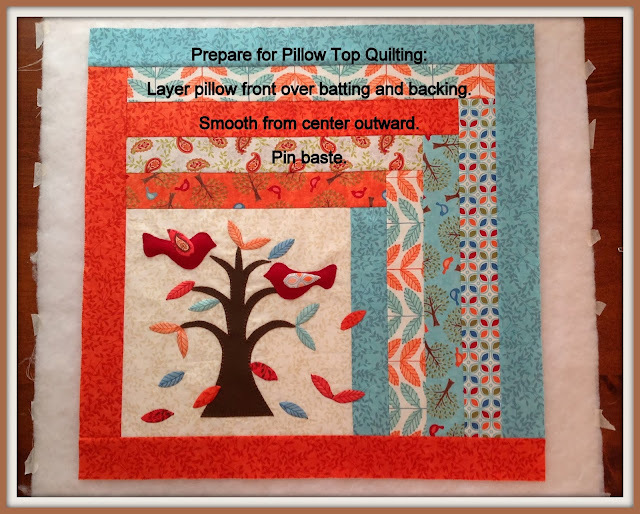 The sample piece pillow top squared up at 24.25″. Important: The above measurement is necessary to trim the envelope pieces. The width of the envelope pieces will need to match the width of the pillow top (trimmed and squared). For now, set your pillow top aside and prepare to piece the envelope back. The sample was pieced using 13 of the remaining jelly roll strips. 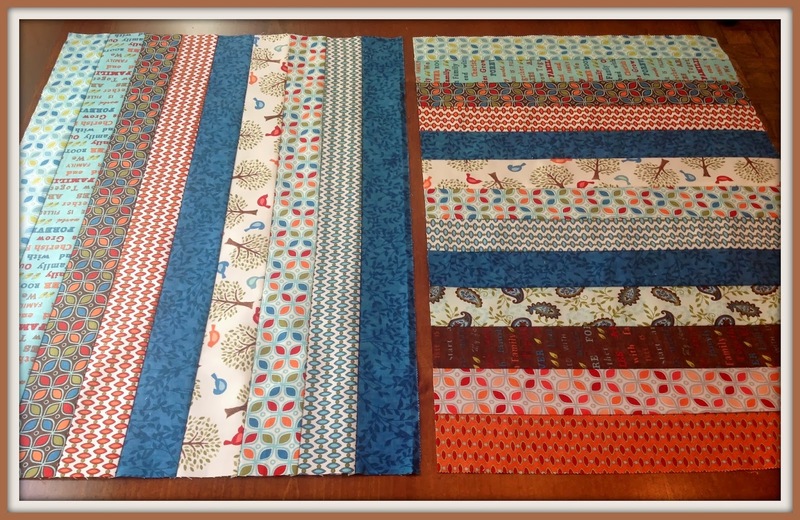 To piece the scrappy back choose 13 WOF strips from the jelly roll. 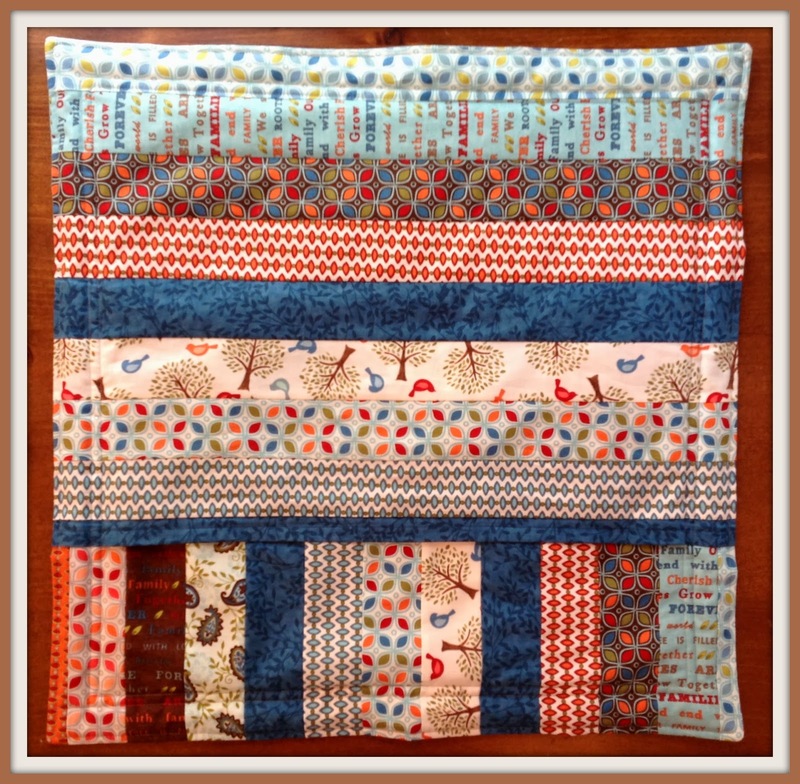 Arrange the strips in a layout that is pleasing to your eye. 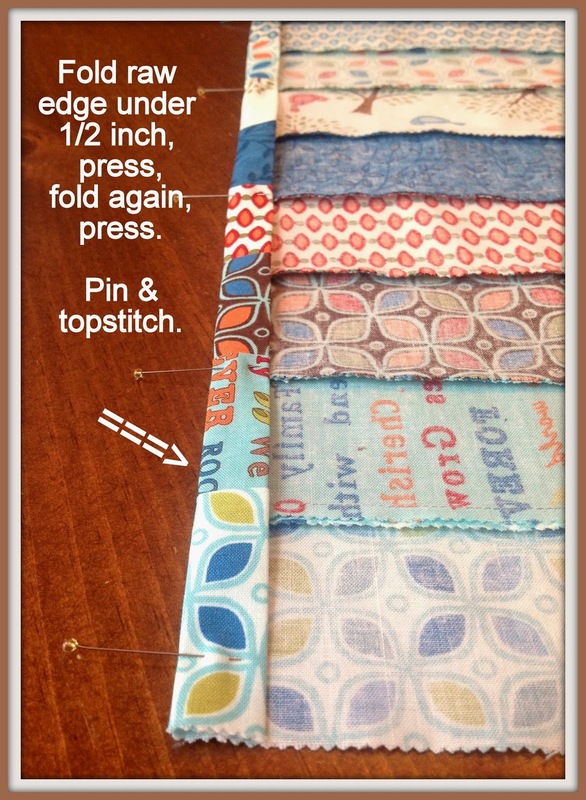 Sew the long sides of the 13 strips together. When complete you should have a 42″ by 26.5″ rectangle. From the rectangle, cut one 26″ by 26″ square, rotate it and trim it to 19″ by 24.25″ (same as the width of pillow top once squared up) with the strips running horizontally. This is the envelope top. Use the remaining 17″ by 26″ piece for the bottom of the envelope. Trim to 17″ by 24.25″ (same as the width of pillow top once squared up). These strips run vertically. 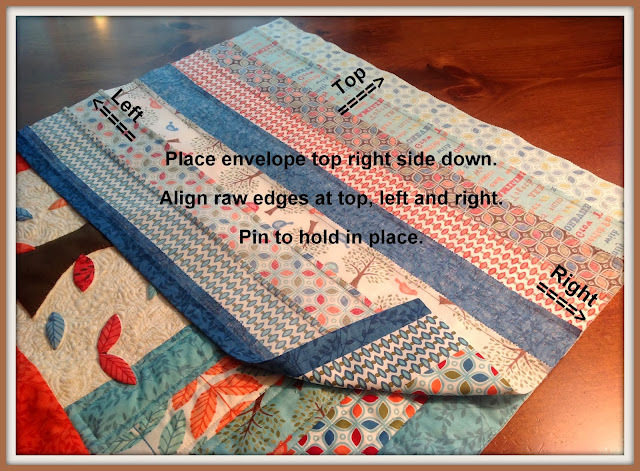 Fold and topstitch one wide edge of the envelope top and one wide edge of the envelope bottom. Now you’re ready to layer, pin and sew your pillow layers together! Be sure all three pieces (Pillow Top, Envelope Top and Envelope Bottom) are the same width. The sample measured 24.25″ wide. Begin by positioning the pillow top, right side up on a table. Add the envelope top, right side down on the pillow top. Align the raw edges at the top, left, and right. Pin. The envelope top will not cover the entire pillow – align it at the top edge. 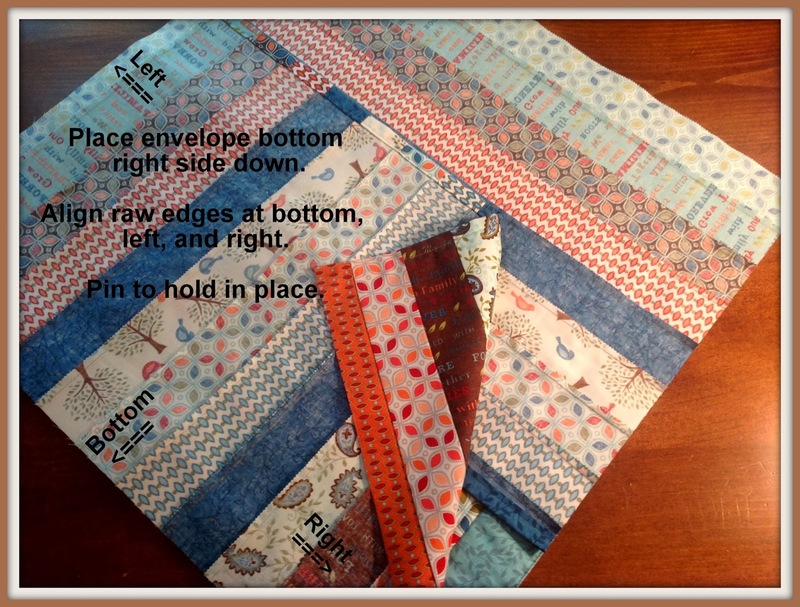 Lastly, add the envelope bottom, right side down over the bottom portion of the pillow top. Align raw edges at the bottom, left, and right. Pin. The envelope bottom will not cover the entire pillow top but it will overlap the envelope top by about 6″. 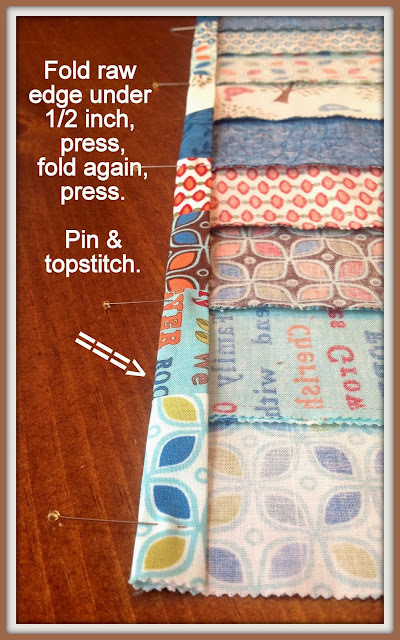 Using your walking foot sew around the entire outside of the pillow layers using a 1/2 inch seam allowance. The envelope opening will allow you to turn right side out. Trim all 4 corners to reduce bulk. Gently press the seams open. Next, turn the pillow right side out through the envelope. Once right side out, reach inside to push out the corners. If necessary, from the right side, use a pin to pull the corner fabric out. Press around the outside edges of the completed pillow. The flange is made by stitching in the ditch, through all layers, as designated by “A” in the diagram below. This makes the pillow the correct size to fit a 20″ x 20″ pillow form. To give the pillow a more finished look, topstitch around the inner and outer edges of the outside strips as designated with “B” below. Now you have a beautiful quilted pillow with flange that you can use for fall or spring decorating. Check out the awesome price on the Family Tree Jelly roll at Cindy’s Sew It Is! 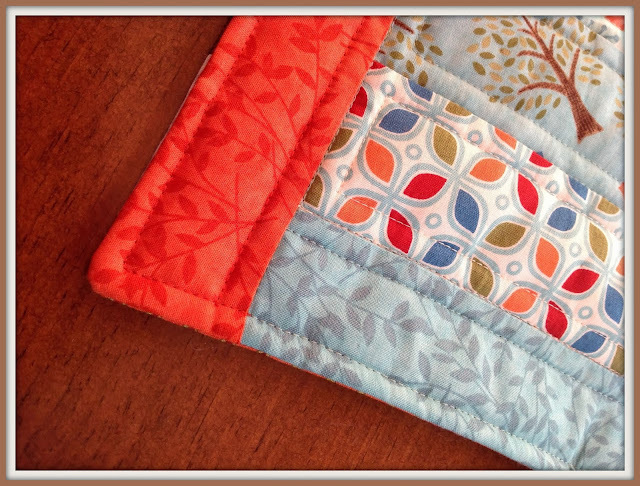 One 22″ x 22″ Quilted Envelope Pillow with a 2″ Flange — and plenty of Jelly Roll strips leftover for an accent pillow!! If you have questions, leave them in the comments below — I’ll be happy to answer them. Also, I would love to have you jump on over to my blog and say hello. 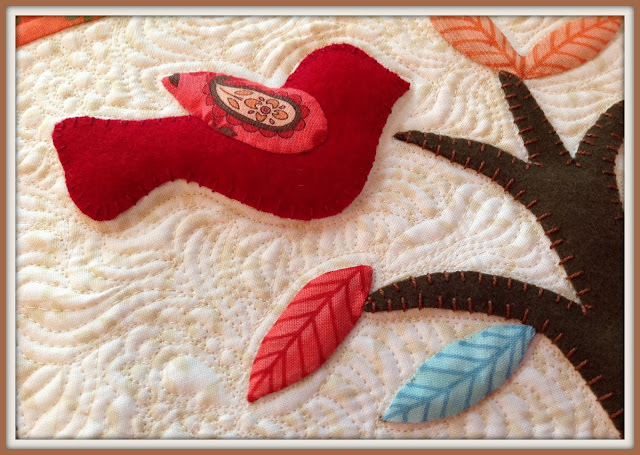 There are some neat posts about Wool Applique here and here, and if you’re interested in learning more about Needle Turn Applique or Free Motion Quilting, stop by in November when I’ll post some basic tutorials on these topics. 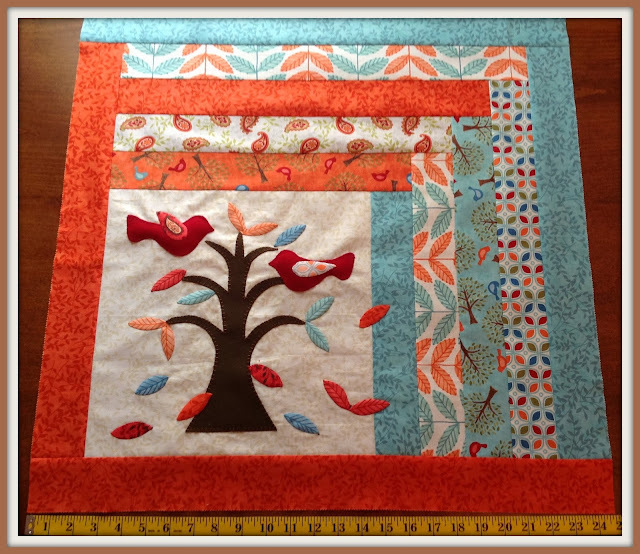 This entry was posted in Home Decor, Jelly Roll, Moderate and tagged Deb Strain, Family Tree, Karen's Quilts Crows and Cardinals, Moda Fabrics, Moda Wool.